Studies continue to tout the many health benefits of teas. Research has found that some teas may help with cancer, heart disease, and diabetes. 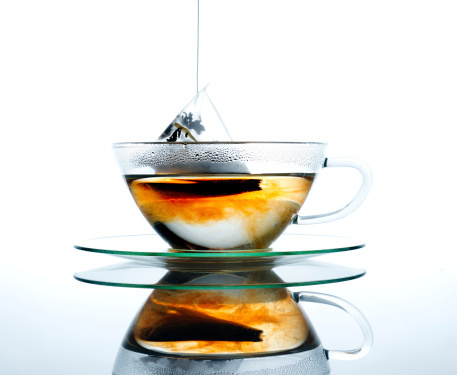 Additionally, some teas may help to achieve weight loss and help to lower cholesterol. But as more and more people start to take up tea time, a recent article published in the The Atlantic raises a hand of caution, pointing out some possible safety concerns when it comes to tea, that most people don’t think about. It may leave you thinking twice before you enjoy your next cup of steeped tea. Many companies are shifting from traditional, paper tea bags, to fancy silk or mesh tea bags, often triangular in shape. Many of these new tea bags are made using plastics or nylon, or other compounded fibers. The problem is that most consumers are not made aware that these new tea bags are made with materials that are potentially toxic to health. In recent years, there has been a lot of concern regarding the hazards of toxins leaking from plastic bottles and containers, most notably bisphenol-A (BPA), bisphenol-S (BPS) and phthalates. These toxins seep into food and drinks from plastic bottles and containers, and mimic hormones that are naturally found in the body and can also interfere with endocrine function. Most of these newer tea bags are made from food grade nylon or polyethylene terephthalate (PET), which are considered the safest plastics in regards to leaching toxins. However, it isn’t known at what point the toxins begin to trickle when steeping tea. If customers were aware that these new tea bags were made of plastics and that toxins were quite possibly leaching into their cup of freshly brewed tea, they may opt for a different beverage. You may think that the solution is simple – switch back to those historical paper tea bags. However, paper tea bags are often treated with epichlorohydrin. The solution may not be as simple as switching back to paper tea bags. Paper tea bags are often treated with epichlorohydrin. Epichlorohydrin is a substance found in pesticides, has been associated with male infertility, decreased immune function, and is a potential cancer causing agent when it comes into contact with water (as occurs with steeping tea). Regular paper tea bags may be just as harmful, and potentially worse, than newer plastic tea bags. What’s more disturbing is that The Center for Health, Environment and Justice has no current research investigating the toxicity of plastic tea bags. Future research should look at the toxicity of both plastic and paper tea bags and this information needs to be made available to all consumers. Once the toxicity of plastic and paper tea bags is established, consumers will be able to make educated decisions about whether they should be using them for tea. The concerns that have been raised regarding tea bags does not mean that you have to give up drinking tea, but you may want to change how you brew it. Instead of using tea bags (paper or plastic), try brewing loose leaf tea. While this takes a little more effort and time and may seem more inconvenient than using a simple tea bag, you will experience all of the health benefits of drinking tea without exposing yourself to toxins in tea bags that may be leaching into your cup of tea.